I thought I'd start with something that crosses a few genres of magic, a card trick which is also a showy and exciting platform trick. In brief, a person selects and signs a card which is then shuffled back into the deck. The deck of card is placed in a holder on a stand and a balloon attached to the top of the stand. 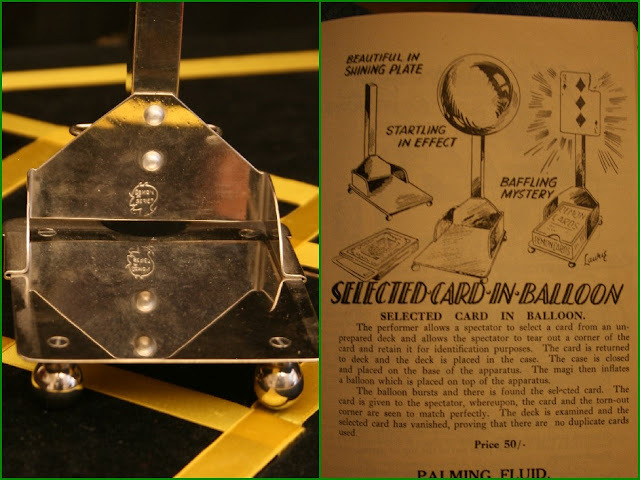 The stand can be held by the magician or placed on a table nearby. The balloon bursts and the card appears in its place at the top of the stand. The example above was sold by Davenports and was marketed as "Selected Card in Balloon". It was released around 1943 and was the second version of a card in balloon sold by Davenports. Above shows the Demon Series stamp on the chrome plated copper mechanism. Also shown is the advert for this model. A few companies made versions of this trick and you can still buy versions today. Below is a very unusual model, I don't know of another example. The effect is the same but is takes extra large cards. It may look like a tiny card stand and a normal deck of cards but the picture below shows it with a modern model for scale. Also below is an advert from a 1965 Unique Magic (Harry Stanley) catalogue. It shows a stand which folds away in the same way as this model and has the same wire extensions to hold the cards, though it is made for standard cards. The advert credits Yimka, a metal worker who made apparatus for Unique. It's probably a fair assumption that he made this jumbo version either through Unique or independently.